SÉPAQ’s mission is to administer and develop the public lands and tourism facilities entrusted to it under its founding legislation. Its mission is to ensure accessibility, develop and protect these public facilities for the benefit of its clients, the regions of Quebec and future generations. SÉPAQ was looking for a solution to centrally manage a comprehensive distribution list and let managers of each park include local content. SÉPAQ also wanted to dynamically display a variety of information on current conditions in each park. In more than 50 parks, M'Pact installed a screen in the reception area and another in the rental centres. The various information is displayed on a split screen. The M'Pact template service lets SÉPAQ easily create messages in various forms either centrally or locally, while maintaining a consistent corporate image. M'Pact’s solution included an approval system so the head office can vet messages created locally by centre managers before they are broadcast. M'Pact also designed all the dynamic data applications to automatically display local conditions in each park, including the weather, tides, river levels, snow conditions and forest fire danger ratings. 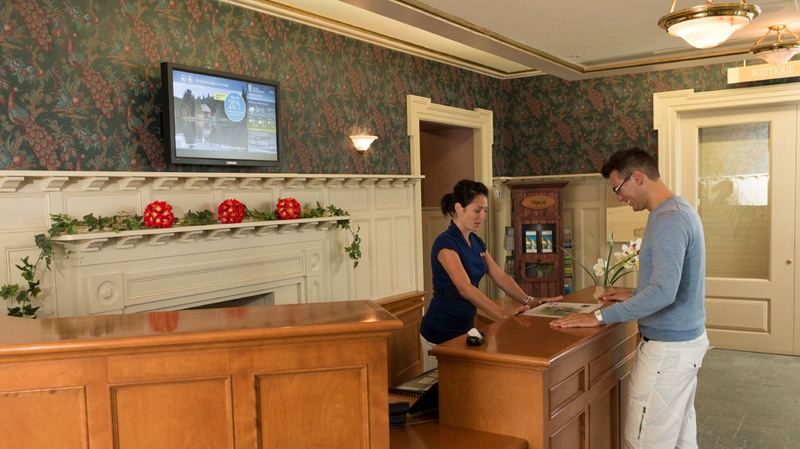 The dynamic screen located in the park reception areas offers three key advantages. - Visitors can obtain information while waiting in the queue. This makes their wait seem shorter because they have something to look at and can already start planning their stay based on the activities featured. - It promotes sales of various activities and services. Reception staff do not always have time to present the full array of experiences available. The screen can showcase “secret treasures” or special discounts. 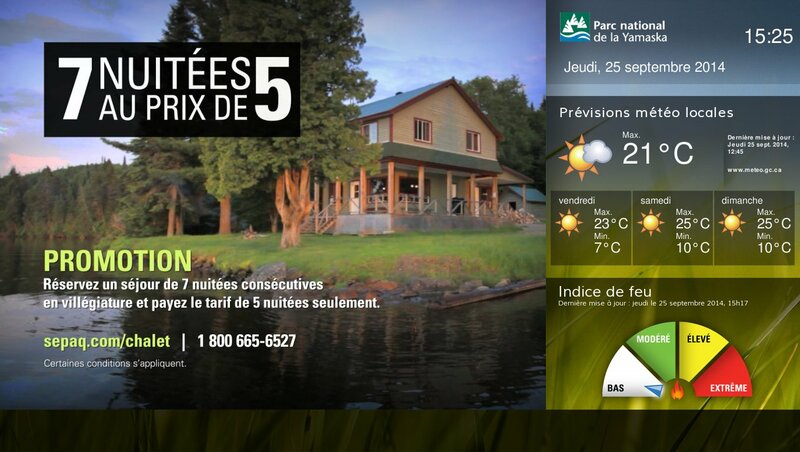 - Frequently requested information such as the weather, river levels or campfire bans can be displayed so visitors do not have to wait for an agent to become available to obtain this information. Moreover, there is no longer any need to post countless bits of paper on bulletin boards.